As expected, the side and color of the dungeon as well as the number of Crimsons and Corruptions are fairly balanced, even across different world sizes. A bit of fluctuation here and there can be seen, but this is not really worth mentioning. The maximal and average amount of World Evils is increasing steadily with the world size. Each world contains at least one World Evil Biome. The minimal amount of bee hives is almost being doubled when increasing the world size. 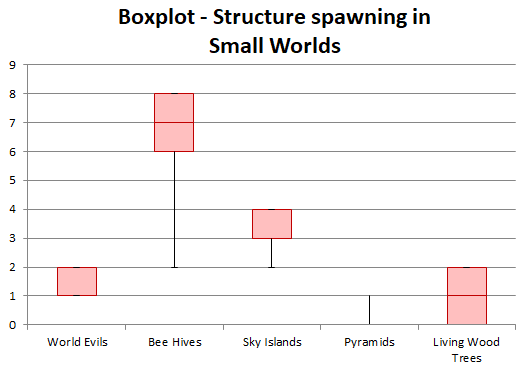 However, the maximal and average amount of bee hives is roughly the same for small and medium worlds. Only on large worlds a strong increase can be noted. As for Floating Islands, nothing really surprising can be seen. The minimal, average and maximal amount is increasing gradually with increasing world sizes, as one would suspect. 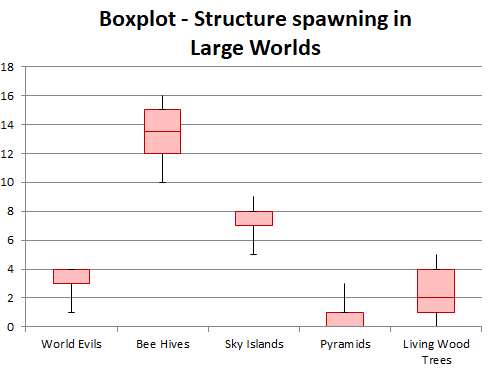 Pyramids, on the other hand, seem to promise more interesting data. Of course, the chances of a pyramid occurring is and stays low for all world sizes. What is worth mentioning though is that the maximal number of pyramids per world is the same for both medium and large worlds alike. 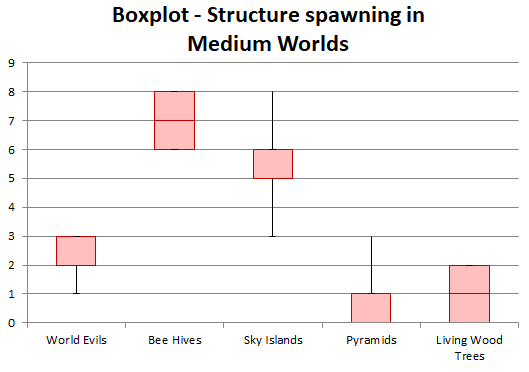 Although the rate for pyramid-spawning is a tiny bit higher in large worlds than it is in medium ones, I think it is safe to say that there is no real advantage in creating large worlds instead of medium worlds when searching for pyramids. But there is a exception to it: I currently know about two different seeds that let four pyramids spawn in one world! Since this is extremely rare, it is not surprising that this case hasn't occurred during the execution of this experiment. These Seeds were found on Reddit. Finally, let's have a look at Living Wood Trees. Surprisingly, the minimal, maximal and average amount of Living Wood Trees is about the same for both small and medium worlds. Only in large worlds a significant increase can be noted. Although it is likely, especially in large worlds, that at least one living wood tree occurs, there is no guarantee that each world has one. As you probably know, not each living wood tree has an underground portion. Only roughly 43% to 47% have one. Interestingly, the percentage is actually decreasing with increasing world sizes. This can be a statistical error, though, since this particular conclusion does not make that much sense.